Students generally relish the chance to create art. They love the opportunity to express themselves and enjoy experimenting with different media. Fitting art into an already full school day, alas, can be a challenge. But according to Mariale Hardiman, co-founder and director of the Neuro-Education Initiative at Johns Hopkins’ School of Education, choosing between art and core instruction may not be necessary; it seems the two can support each other quite well. Her research has found that the use of arts in the classroom does more than make students happy: it can improve their retention of information. In a simple, elegant experiment, Hardiman compared groups of students who simply learned facts about history with groups who learned history with an art component. For example, students might draw a picture to illustrate historical events, put historical facts into songs, or write creatively about historical information. After learning, both groups of students were tested, and initially there weren't any differences between their scores. But when the students were tested again three months later, the arts group demonstrated much better retention than the control group. 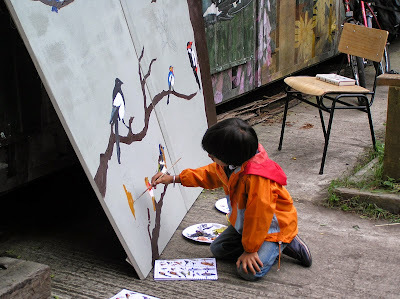 We think incorporating the arts into learning wherever possible is a great idea, and not just because it seems to promote better memory for facts. Adding an art component to classroom work allows artistic kids to shine in a way that they sometimes can’t in a purely academic setting, building self-esteem. And, of course, art encourages children to be creative, flexible thinkers and to experiment with symbolism and abstract concepts. Ask students to write a poem about what they’re learning. Use models and get creative. Show kids some limericks and ask them to write their own about a character in a novel. Rewrite one of Shakespeare’s sonnets to become an ode to a plant cell, a planet, or the Constitution. Challenge students to take on the role of a historical figure or a fictional character and ask them to write a letter (or an email) to another figure or character. This isn't a new idea, but it can become really fun when kids are given unexpected roles. A student could write a letter to a cloud from the perspective of a plant who is hungry and needs exposure to sunlight so it can use photosynthesis, for example. Students struggling with algebra? Have fun with tricky concepts such as like terms by asking students to write a love letter from the perspective of 2x explaining why s/he adores 5x but has no interest in mixing with 6y. Creating fictionalized accounts can make academics come alive. Challenge kids to write a story about the experiences of an oxygen molecule who is breathed in, circulated through a body, then breathed out. Ask kids to imagine that they are Louis XIV’s footman or Genghis Khan’s horse. What would they hear and see in these roles? Ask students to tell a story (the plot of a novel, the series of events during an important time in history, the transition of water from a solid to a liquid to a gas) frame by frame. For students struggling with causes and effects, illustrating the relationship can be very helpful. Set the stage for cause-effect panels by asking students to fold a sheet of paper in half. On the left side, they can illustrate the cause, and on the right, they can draw the effect or effects. If a student is studying the effect of temperature changes on matter, for example, he can draw a picture of a thermometer with rising mercury on the left, and molecules bouncing into each other with frantic arrows between on the right. Sometimes, students may need to divide the right side of the paper to show several effects. For example, The Stamp Act caused the colonists to both boycott British goods and to form the Sons of Liberty, so a cause-effect panel illustrating that relationship would have two parts to its effect side. This activity can be enriched by assigning a short piece of writing to describe the cause-effect relationship shown, or by asking a student to explain their work orally. Need to learn about the anatomy of the heart or the difference between Doric, Ionic, and Corinthian columns? Sometimes the best way to commit lots of small details to memory is to draw them. Ask students to draw and label their own diagrams showing the details of these complicated concepts. Color-coding can make diagrams even more valuable; perhaps students could color the pathways of blood into the heart in blue and the pathways out of the heart in red, or shade the columns’ similarities in yellow and their differences in green. Really talented musicians will love the opportunity to come up with their own songs about academic topics. For students who don’t play music or write songs, challenge them to rewrite songs they know so that they lyrics are about an academic topic they are studying, like the events in a novel, the Bill of Rights, or the order of operations. Challenge kids to write and perform short skits that illustrate important events and concepts. Perhaps they could perform a short dialogue between nobles as they discuss the merits and potential risks of presenting King John with the Magna Carta. Have students act out word problems to help them visualize the situations being described. Assign students the roles of different elements and ask them to come up with a skit about what would happen if some of them ran into others at an element party or on a bus; what reactions would occur? What would passers-by notice? Comparing and contrasting the ideologies of historical figures, the concepts of different geometric shapes, or the arrangement of plant and animal cells? Give pairs of students opposing roles and ask them to generate some arguments about why their perspective is superior to that of their opponent. Costumes can bring this idea to life! Icon credits: Itzik Gur (paint, music); Design Contest (pencil).